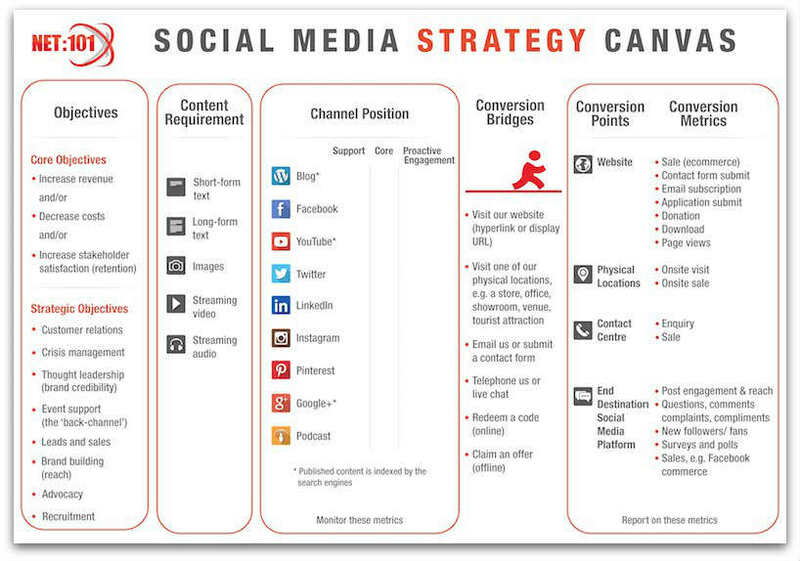 A social media strategy should be driven by, and tangibly contribute to, at least one core objective. Identifying the core objective/s will determine the choice of strategic objective/s. *NB: Customer relations and crisis management may not be strategic objectives, but public stakeholders may nonetheless use one or more of your social media platforms as customer service touch-points (for questions, comments or feedback) or gravitate to them during an incident or full-blown crisis. You may not want this to happen but it’s difficult to prevent. *Any content published through these platforms has the advantage of longevity because it can be crawled, indexed and indefinitely resurfaced by popular search engines such as Google. The selection of social media platform/s is determined by where the target audiences are already gathered (and in the mindset) against your stated strategic objectives. Then the focus becomes one of producing content in the appropriate format/s to publish through the platform. For example, Facebook requires short-form text (sharp copywriting) and images; a blog requires long-form text; Pinterest requires high quality images (that have been pinned from your website). The selection of social media platforms is determined by the formats of content your target audiences prefer to consume and engage with in line with your stated strategic objectives. Then the focus becomes one of choosing the appropriate platform/s to host and distribute your content, and to build your community. For example, audiences wanting subject-matter detail and depth might prefer long-form text, steaming video or audio which would necessitate a blog or YouTube or a podcast respectively. Or they might prefer image-based content in which case Pinterest, Instagram or Facebook could come into play as the host and engagement platforms of choice. A subtle distinction can be made between ‘core’, ‘supporting’ and ‘proactive engagement’ platform positions, each requiring varying degrees of resource and commitment. These are the platforms where the bulk of the content being published through them is native, i.e. content which has not been syndicated or cross-posted from another social media platform. It is your very best content, and is closely aligned with the preferences of your target audiences who gather around it. 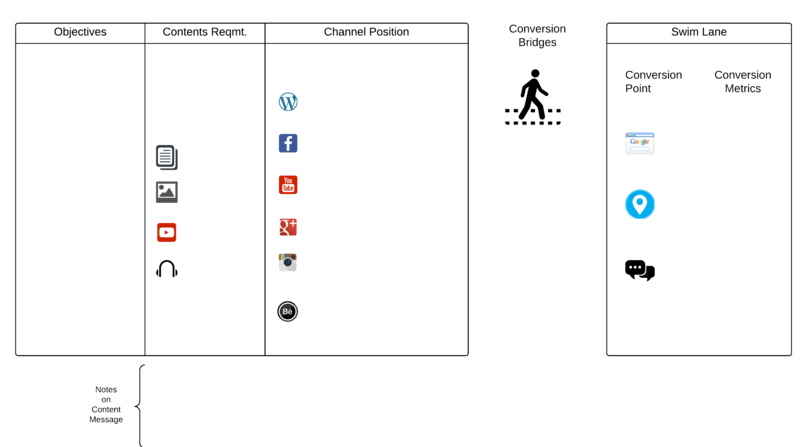 These platforms play a supporting role by amplifying the content being published through the core platforms via syndication (cross-posting and cross-linking). Syndication is the process of manually or automatically pulling content from one social media channel and pushing it into another, e.g. cross-posting a YouTube video which is playable within Twitter, Facebook or LinkedIn without the need to click back to YouTube. Cross-linking is posting a summary – usually a title, short description and an image – of a piece of content sitting elsewhere which the user is invited to click across to, e.g. a link from Twitter, Facebook or LinkedIn to a blog post. Systematic syndication can extend the reach of your branded content to different audiences, and increase your follower and subscriber numbers. The chosen platform/s through which you organisation will proactively engage your target audiences – this is the ‘social’ in social media. Pushing content to followers, fans and subscribers is increasingly complemented with dialogue and self-generating conversation treads. It can be a large input of time and commitment to establish and maintain a community, but the rewards are many. The rules, guidelines and KPI’s of community engagement should be codified in the form of an organisational social media policy. Bridges carry people across to conversion point places – environments where the pointy-end of organisational level social media takes place. There are four main conversion-point places: your website, including microsites and campaign pages; physical locations; your contact centre; or another social media platform. Each conversion-point place provides differing conversion opportunities (and measures), as well attribution insights. Conversion place metrics should be the key indicators of social media success, not the activity or ‘vanity’ metrics contained within each social media platform. Get them to your principal online asset and which offers greater control over the user experience. There’s no distracting third-party advertising, you can self-style your CTA’s and conversion paths, and have direct access to your own website analytics, including referral traffic by channel (inc. social media) and conversion goal tracking. Easily measured goals including reverse source analysis of ecommerce sales, downloads, page views, enquiries via contact forms, applications, donations and email subscriptions. The website can also serve as an intermediate bridge to the 3 other conversion-point places listed below. Get them to travel somewhere. Compared to a website visitor a physical location visitor is more difficult to identify as having directly or indirectly originated from a prior social media touch-point (commonly referred to as the ‘attribution problem’). Goals within this context may include onsite visits and onsite sales – in both instances redemption codes are one possible means of identifying a specific social media activity or platform as the major contributing factor. Communicate with them directly and fast-track the relationship building process. Goal conversions may include telephone and email enquiries or sales, but may not be attributable to any social media activity unless campaign specific redemption codes are used. In some instances a contact centre member may openly ask how a caller or sender found out about the organisation or offer. Get them to the principal social media gathering place. For example, an organisation that positions and resources Twitter or Facebook as a customer service channel, or uses a LinkedIn company page for recruitment purposes. Conversion-point place metrics in this instance could include engagement triggers such as the number of questions, comments, compliments or complaints received, post engagement activity, individual or aggregate post reach, competition entries, surveys and polls completed or direct sales, e.g. Facebook commerce. Once your social media strategy is launched you’ll be in a better position to adjust allocations of staff time and money (typically more than you think) against your resource capabilities (typically less than you’d like). Or alternatively adjust your goal conversion targets up or downwards. 활용을 원하시는 분들은 템플릿으로 만든 PNG 파일 이용 해 보시기 바랍니다. 다가오는 10년을 위해 멕켄지가 뽑고있는 인재는?